Actor and producer Michael Douglas recently paid a visit to Bermuda, with a Facebook post showing him on a beach garnering a tremendous amount of attention. Added to the social network late last night [Mar 31], the post has already attracted almost 2,000 comments, more than 1,000 shares, and nearly 40,000 “likes” among Mr. Douglas’ one million Facebook fans. Mr. Douglas is set to feature in documentary film, Supermensch: The Legend of Shep Gordon, that will screen at the upcoming Bermuda Documentary Festival. According to a Bermuda Docs spokesperson, “the film is about the larger-than-life music and show business figure who managed top acts, was boyfriend to Sharon Stone, and is friends with the Dalai Lama. The famous actor and former Bermuda resident is the son of Bermudian Diana Dill, who is an accomplished actress in her own right. Thanks for the positive PR for your island home Michael. Your fellow Bermudians are most grateful! Might as well get ride of de Tourism Board. No, that would be a PLP approach. An OBA approach would be to ask him to JOIN the Tourism Authority for an undisclosed salary so they could take advantage of his star status to rejuvinate tourism even further. The PLP is filled with people that think like you and that’s why I’m glad they aren’t in charge. @ Mazumbo The BDOT ceased to be at midnight of March 31st. Your comment is irrevelant as usual. Amazing what a change in Government can do to create an air of optimism for the future. I didn’t expect the ship to start turning around this quickly though! Amazing how some lay in wait with daggers to exact revenge instead of being encouraging!!! So Ariel sands is being redeveloped? into what? where does it say Ariel Sands is being redeveloped? ok then where are they building a new cottage colony? we DON’T want to hear anything from flip flop! How about sharing something positive instead of hate filled vile character assassinations? Maybe you could join subscriber for some therapy for your inability to let go! I did let go,I let go along with many others…which is why Bermuda got a change of Government! You are the one along with many others that need therapy,but then,it’s probably too late for you! Did Michael Douglas’s family arrive on board “The Sea Venture” in 1609? No, but possibly amongst the 1612 colonists who settled the Island. they arrived on the “Plough” in 1612? 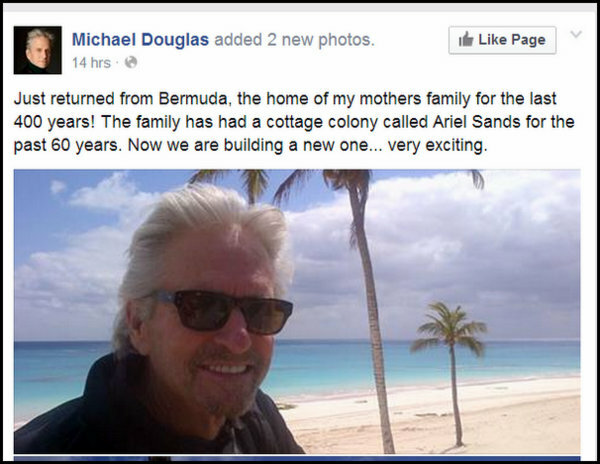 Michael Douglas is also a Bermudian himself! Actually he is born American. His mother is Bermudian so he has status. There is no difference between a Bermudian and status Bermudian. Both have the same rights to vote, buy property, work, etc. This hasn’t stopped certain xenophobic elements of PLP/BIU and their narrow-minded supporters, however, from trying to redefine what it means to be Bermudian through the creation of second class citizens which, given the nexus of the party/union and some of the reasons for their formation, are completely hypocritical and illogical. Therefore and sadly … hardly surprising. Indeed those who are born here of Bermudian parents are still only Bermudian by Status. I clearly remember having to get my daughter’s “Papuss” when she was young. Not enough to be born at KEMH of two Bermudian parents, you still got to go an get the Status stamp and certificate at immigration. If you have status you are Bermudian. Period. This is great positive publicity for our island!!!! GREAT NEWS for BERMUDA – GOOD TIMING. Sweet and all. But what where they doin in bermuda 400 years ago. Hm wish they taught us bermudian youth about our colonial history, since we have to acknowledge someones else amazing 400yr history on the island. Bermudian families worked as slaves for free. To later earn their status. Now rich people Buy* what my relatives died and faught for. Come on Fine-d-troof: Did they work for free then earn status? Or did they die and then ‘faught’ for it? Or are you prone to exaggeration? If his mother was Bermudian, no matter where he was born, he is Bermudian. Where on earth do people get the idea that he must be born in Bermuda to be Bermudian. I was born in Bermuda and my father was Canadian and Bermudian. Therefore, I am Bermudian AND Canadian. When immigrants to the US swear allegiance to the US, they become American. Not status American….whole hearted fully and completely American. Bermuda needs to grow up. Our population is shrinking…we need more Bermudians. Get rid of the ridiculous word Status …they are Bermudian just like me and I am proud of them all. Well said , but there’s a few Bermudians I’m not so proud of. Just read more info. Nowhere does it state that they are redeveloping it for tourism. It could be just being redeveloped for family use.